Many people have heard that feng shui views the number "4" as being inauspicious, or bad luck. Although broadly believed, this view derives from a superstition that really makes sense only to speakers of the Cantonese language. In Cantonese, one of the native Chinese languages, the pronunciation for the number 4 sounds very much like the pronunciation of the word for "death." For this reason, it is not only in the practice of feng shui but for all of Chinese culture that 4 is regarded as an unlucky number. Before we deride this custom as simple folklore superstition, we should remind ourselves that many Western people have similar feelings associated with the number 13, and that many refuse to fly on 9/11 each year. And we might well feel differently about the number 4 if this coincidence was found in English. Imagine, for example, how we might feel about the number if, as we counted to ten, the recitation sounded like "one, two, three, doom, five, six...."
For Westerners, the number 4 has no such connotations and thus is not unlucky at all. We have four seasons and four compass directions, for example, and neither are considered unlucky. 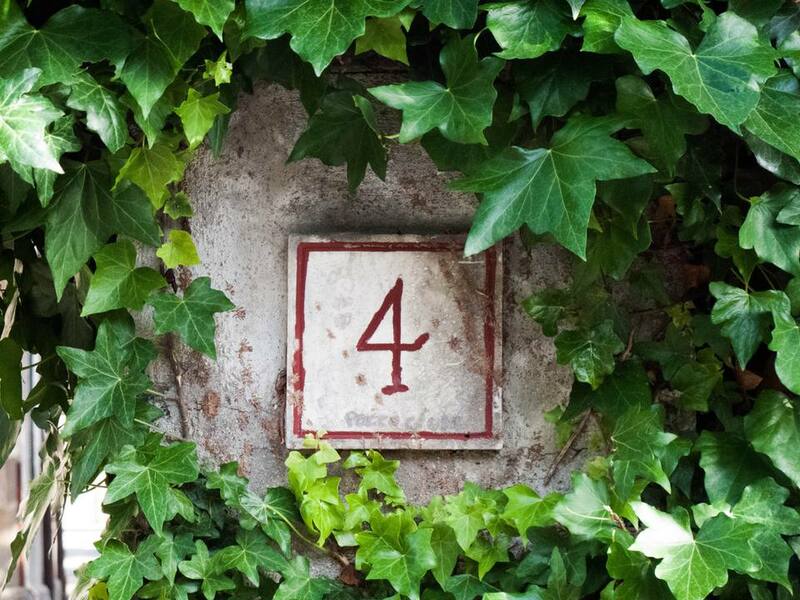 In fact, in Western traditions and numerology, 4 is generally a friendly, life-affirming number. It has strong grounding energy and it will teach us the lessons we need to learn in order to move forward in life. The strong energy of 4 tends to ground you until you have learned a lesson being presented while protecting you at the same time. Unless you use the Cantonese dialect on a daily basis, there is really no reason to worry about the number 4. But if it concerns you, the traditional feng shui cure is to encircle the number in color red. Being the color of the fire feng shui element, red is thought to protect from misfortune and help attract good luck. You can also apply any other feng shui house protection cures that make sense to you. More important, though, is to examine the luck of the previous occupants of your home and the energy they have left behind in the space. If the experience of previous inhabitants is unfortunate, you might want to do some strong energy clearing (feng shui space clearing and smudging, etc,) before settling into that apartment or house. There can be strong and heavy energy residues in your space that have nothing to do with number 4 and everything to do with the energy of the people who lived there. There is also the possibility of undesirable house features (in other words, bad feng shui) that promote the energy of conflict. Numbers are important symbols, and there is no disputing that they have an impact on our homes. However, the reputation of the number 4 for having bad feng shui is largely undeserved. Much more important is to follow general feng shui guidelines for managing the energy of your home.